Useful Social Media, a business intelligence firm located in London and New York, recently released a report, The State of Corporate Social Media 2012, bringing together findings from a survey of over 650 digital marketers. The survey participants were nearly evenly split between agency-side and in-house corporate digital marketers, with a solid mix of B-to-C and B-to-B practitioners. The report chronicles the continuing struggle to integrate social into marketing, along with noting some differences in social media marketing adoption between U.S. marketers and their European counterparts. 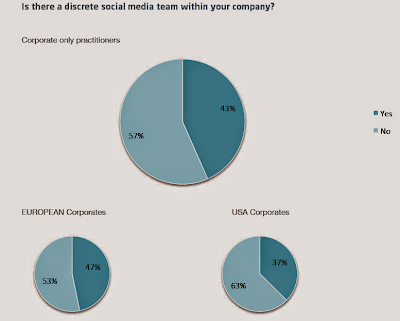 What is one to conclude from the fact that 63% of U.S. companies included in the survey had a designated social media marketing team, compared to 53% for European companies? The report correctly observes that there are two "opposite conclusions" one could reach from these statistics: 1) the lack of a discrete social media team points to a lack of social media adoption or 2) the lack of a social media team suggests that social media has become "fully embedded throughout key departments." Answering the dispute, the report notes that "the reality falls somewhere between the two poles." According to Useful Social Media founder, Nick Johnson, who now splits his work primarily between London and New York, U.S. digital marketing teams tend to be "bigger" and "have more autonomy and power" than than their European counterparts, a sobering thought when so many U.S. digital marketers cite a lack of authority as continuing impediment to social media initiatives. Johnson also notes that European social media marketing still tends to weigh too heavily on using social media as another broadcast channel, "pumping out marketing messages to large groups," rather than actually tapping into the social dimension of digital marketing. This gap, however, according to Johnson, is steadily closing as European marketers become more savvy in their use of social media. To learn more about the State of Corporate Social Media, join Useful Social Media in New York City, on June 13 and 14 for their third annual New York City Corporate Social Media Summit. As a media sponsor of the event and moderator for social governance and brand managment sessions at the conference, I hope I'll have a chance to see you there! The report correctly observes that there are two "opposite conclusions" one could reach from these statistics: 1) buy instagram followers $5 the lack of a discrete social media team points to a lack of social media adoption or 2) the lack of a social media team suggests that social media has become "fully embedded throughout key departments.